Earns Jeff Boccaccio's DPL Seal of Approval! Jeff Boccaccio, President of DPL Labs, will be sharing his expert views on DPL Standards and HDMI Technology at our Transformative Engineering CEDIA booth (#1735) on Thursday, September 6, at 1:30 PM. Please join us! Only the Best Pass the Test! DPL Laboratories, the industry's leading digital testing laboratory specializing in the performance assessment of digital signaling solutions such as HDMI 4K Category Cable Extenders, announced it has issued a second prestigious Full 4K UHD 18 Gbps DPL Seal of Approval to Transformative Engineering for the HLE-4K. 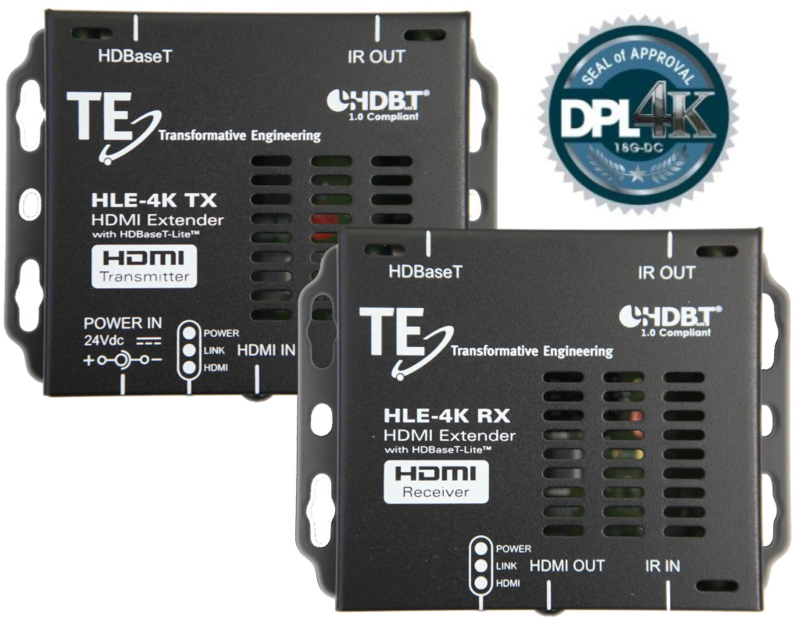 Jay Trieber, President of Transformative Engineering and President of Home Theater Concepts in Norwood, MA, noted, "We are exceedingly proud to be worthy of the second DPL Seal of Approval for a Full 4K UHD compatible HDBaseT HMDI extender. Our HD-4K was the first Full 4K UHD compatible HDBaseT HDMI extender to receive the recognition of DPL Labs prestigious DPL Seal of Approval. We all know DPL Approval is only awarded to HDMI equipment that tests to especially arduous and meticulous standards. TE's products truly are designed for custom installers, by custom installers." Jeff Boccaccio, President of DPL Laboratories, remarked, "Great long distance product that tests beyond DPL's reliability standards." Specifications for T-E's HLE-4K include 4K 60Hz 4:4:4 w/HDR, compatible with the maximum HDMI 2.0 specification of 18 Gbps data output. The HLE-4K is HDCP2.2 compliant and compatible with legacy HDCP and previous versions of HDMI. It extends Full 4K HDMI and IR (Bi-Directional) up to 30 meters (100 feet). Greater distances are achievable with lower resolutions (Full HD, HD, etc.). The HD-4K also earned the DPL Seal of Approval. The HD-4K extends Full 4K HDMI up to 60 meters (200 feet) and includes RS-232. These two Transformative Engineering SKUs are currently the only HDBaseT copper extenders to have earned the DPL Seal of Approval for compatibility with Full UHD 4K 18Gbps 60Hz 4:4:4 output.